This is Kyra’s second year on the varsity squad. Kyra is called “the team mom” as she is always looking out for everyone’s well being, giving her “motherly advise” and truly just caring about each and every person. 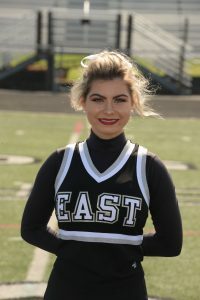 Kyra’s hard work and dedication shines through each and every Friday night as she cheering! She has been a wonderful addition to our cheer program for the past 4 years! Jackson has been an intergral part of the East Defense in 2018 at the safety position. 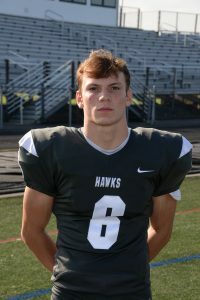 Against Hamilton, Jackson intercepted a Big Blue pass and returned it 32-yards for a Thunderhawk touchdown. His work ethic and leadership has been a strong example to his teammates this season.